Daniel Radcliffe in beat poets film Kill Your Darlings reviewed, singer John Newman, Emil and the Detectives on stage, and bestselling autobiographies put to the test. 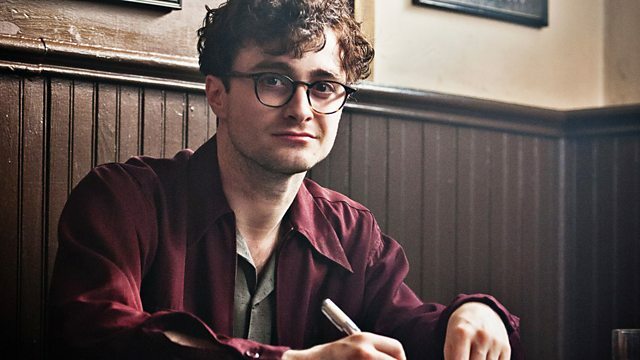 Daniel Radcliffe's latest project is playing the young Allen Ginsberg in Kill Your Darlings. Based on a true story, the film follows a 17-year-old Ginsberg as he starts at Columbia University in 1944. A murder draws him together with Jack Kerouac and William Burroughs and leads to the birth of the Beat Generation. Writer and critic Michael Carlson gives his verdict. Writers Alex Clark and Danny Kelly discuss which of this year's best-selling autobiographies have the X-factor, judging the works of Morrissey, Sir Alex Ferguson and Jennifer Saunders by artistic impression, revelations, scores settled and sexual content. Singer John Newman first attracted attention for his vocal on Rudimental's hit single Feel the Love last year. He followed that success this year when both his debut single Love me Again and debut album Tribute topped the UK charts. He reveals where the raw emotion on his album comes from and discusses the challenge of writing a follow-up. This year's National Theatre Christmas show is an adaptation of Erich KÃstner's classic children's novel Emil and the Detectives. Detective novelist and critic Stephanie Merritt was at the first night and gives her response. Kill Your Darlings is in cinemas from 6th December, certificate 15. John Newman’s album Tribute is out now. Image: John Wilson and John Newman in the Front Row Studio. Photocredit: Jerome Weatherald. Emil and the Detectives is at the National Theatre until 18th March 2014. Image: Judy Flynn, Stuart McQuarrie, Daniel Patten and Ella Kenion in a scene from Emil and the Detectives. Photocredit: Marc Brenner. My Autobiography by Alex Ferguson, Autobiography by Morrissey and Bonkers by Jennifer Saunders are all are available now in e-book and hardback. Magazine programme on the worlds of arts, literature, film, media and music. A season discovering where artists find inspiration and helping listeners get creative. The best of British culture live and on demand. Join Mary Beard and guests for live and late debate on Friday evenings on BBC Two.